Social Media Manager vs. Community Manager: What’s the Difference? Pop quiz: who matters most when it comes to your social presence? Your followers? The folks whose attention you’re trying to grab? The people sharing your stuff? Sure, those people are important. But what if it was the people working behind the scenes that represent the real game-changers? Think about it. 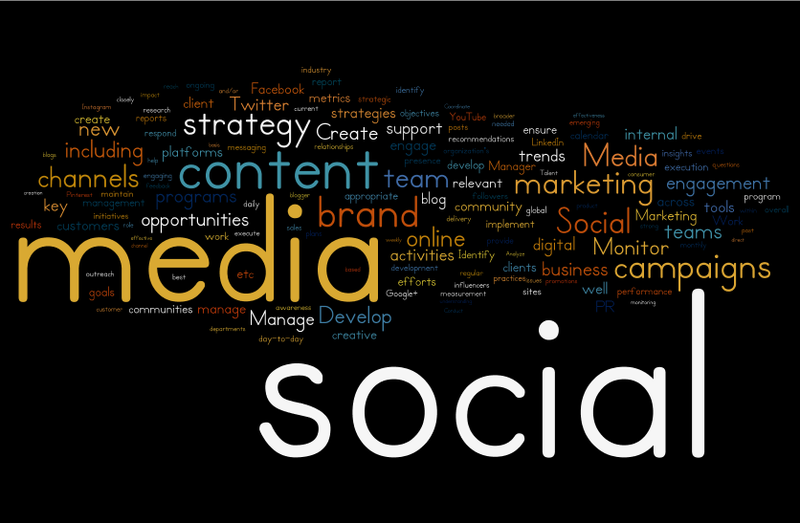 Social media has become the go-to channel for customer care, content curation and branding for modern businesses. There’s a reason why keen attention to detail to your company’s social accounts is a top priority. As a result, social media and community managers are vital for your brand’s social media efforts. Although some may think that the roles of social media manager and community manager are synonymous, their functions and responsibilities are quite distinct. In fact, here at Sprout Social, we treat each role very differently. To better illustrate these two crucial jobs, we talked to our very own Social Media Manager Darryl Villacorta, and our Community Manager Vera Flores to get the scoop on their roles, responsibilities and advice for others. And for you existing community and social media managers out there, make your job easier and try Sprout Social free for 30-days. What Are the Major Differences Between the Two Roles? A social media manager is responsible for being the brand on social media. They create content, craft copy for posts, respond to comments, answer questions and much more as the brand. Social media managers, more often than not, deal with people who have a relationship with, or have heard of, the brand. While the two roles may seem identical, social media managers essentially act as actual brands while community managers represent themselves on behalf of the brand they’re promoting. 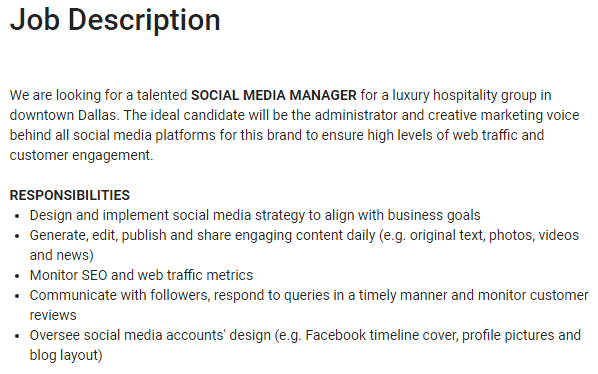 What Does a Social Media Manager Job Description Look Like? 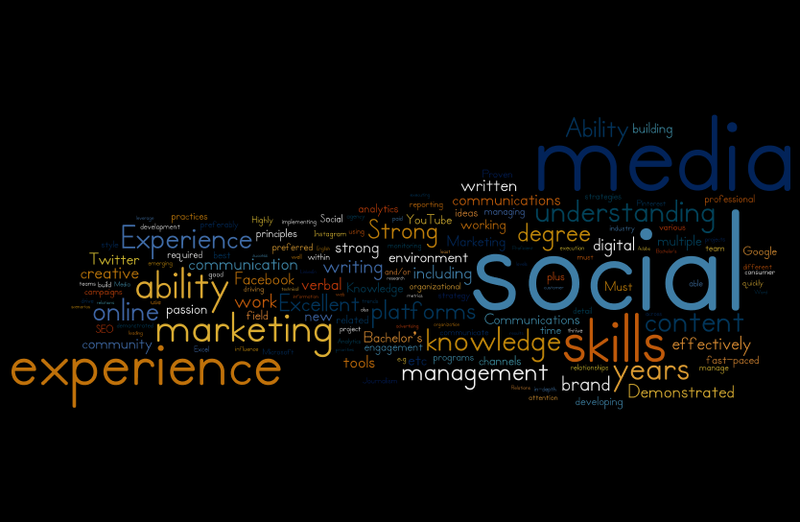 In order to come up with a completely objective job description for social media managers, we pulled 25 job listings from a LinkedIn job search for “social media manager” and created a word cloud highlighting the responsibilities of the position. As you can see, the biggest trend associated with the modern social media management is the ability to strategically create and distribute a brand’s content across a variety of different social networks. If you’re an individual hunting for such a role, these are the sorts of skills you should emphasize on your application, resume or LinkedIn profile. There are other important keywords associated with most social media managers that help flesh out the scope of their role: team, support, engagement, execution, manage, opportunities and (of course) social. Although the role might seem pretty simple on the surface, there’s obviously plenty for any given social media manager to juggle. Especially if you’re regularly handling customer concerns or work on behalf of a brand with tens of thousands of followers (or more). For those looking to how to structure, organize and build a quality social media team, we partnered with HubSpot to provide you with this free guide! Download it now to get your social team started. We know that social media managers spend the average day making sure customers have an above-average day, and spreading awareness for brands, but what specifically do they do? We asked Darryl to break down what a typical work day looks like for him. Keep in mind that no two days are the same for social media managers, but this will help paint a clearer picture. If you look at the daily habits of these two it’s pretty easy to see the similarities. They both spend a majority of their time responding to and helping our customers, followed by strategizing & executing content strategies, then analyzing their successes and meeting with the team to discuss next steps. Do you think you have what it takes to become a social media manager? We analyzed the same 25 job descriptions from LinkedIn and made this word cloud based on the requirements listed by each company. 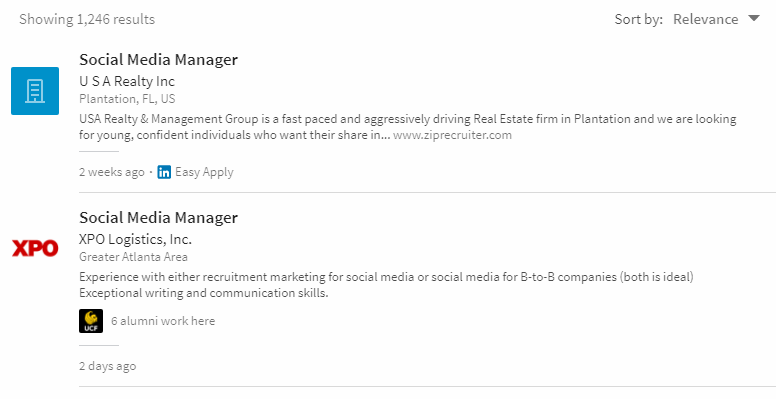 You can see that “experience” is one of the most important prerequisites for companies recruiting social media managers. However, don’t let that discourage you if you haven’t run social for a Fortune 500 company. Our own Darryl was able to get his start in social media management by developing a social presence for himself first. In other words, if you’ve built up your own following independently, use that as leverage when hunting for social media manager positions. Groups on LinkedIn have a separate jobs tab. Here’s the one from the “Social Media Marketing” group. Facebook Groups like “Social Media Jobs” are a great resource. 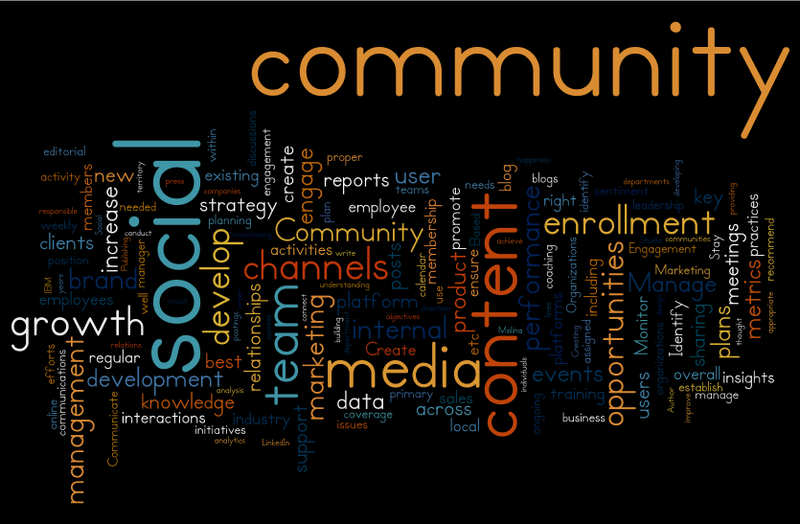 We gave a description of how we view community managers at Sprout Social, but in order to objectively define the role we made a word cloud similar to the first. That said, our LinkedIn job search for “community manager” didn’t yield as many open positions, so we were limited to pulling 10 listings. Words like “growth” and “engage” are much bigger keywords in the role of community manager compared with the social media manager. This reinforces the idea that most community managers are focused on engaging with new prospects in order to grow the overall brand community. Community managers are expected to have strong networking and communication skills. Keeping in line with the voice and personality of a brand may sound like a cakewalk, but mastering the tone of a company is often easier said than done. As noted earlier, the skillset of a community manager is very particular and requires managers to pay close attention to every aspect of client and customer communication. Vera spends her time bolstering a fantastic community for Sprout Social users to thrive in, but what exactly does her day-to-day schedule look like? In short, a community manager acts as an extension of the brand they represent. They’re flesh-and-blood people who get in the trenches with clients and customers, meanwhile also engaging with new prospects on a regular basis. An effective community manager basically provides brands with a face that encourages personal connections between a company and its followers. We looked back through the same 10 job descriptions from LinkedIn to find some key requirements that companies seek when looking for a community manager. 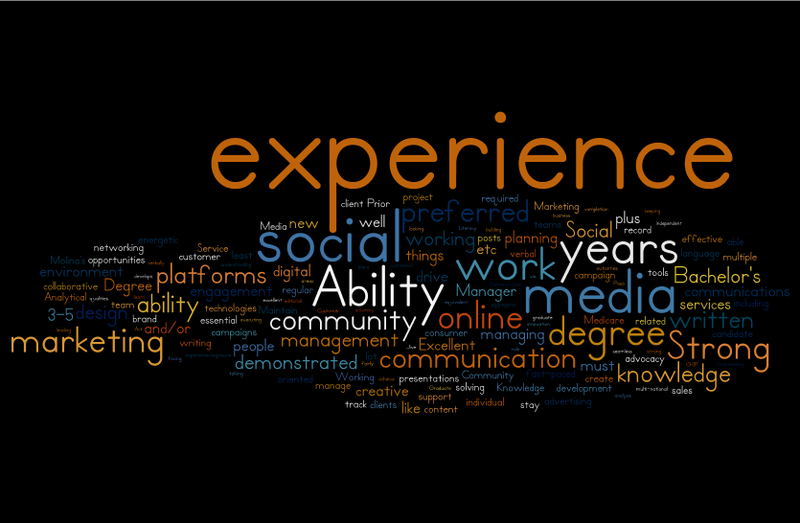 Based off this word cloud it seems like a lot of the companies are looking for people with 3-5 years of experience. However, don’t fret if you’re a bit below that level; try to do what our community manager Vera did to gain her first position: assist first. The Community Roundtable does a weekly round-up of open positions and tweets them out. The Community Manager, Advocate and Evangelist Facebook group often posts positions. Online job boards like this one from CMX Hub are another useful resource. What’s Your Social Job Advice? The roles of social media and community manager are both so important but easy for businesses to overlook. Understanding the difference between the two makes all the difference whether you’re trying to apply for social jobs or hire for each role internally. If you have any advice to add, feel free to join the discussion. Whether it’s how you got involved in social media, what you think a good daily workflow is, where to find a job, or anything that could help the new faces of social, we’d love to hear from you!